Beneath a thick rainforest canopy you get a thrilling first glimpse. Emotion is everywhere and the intimacy brings goosebumps. 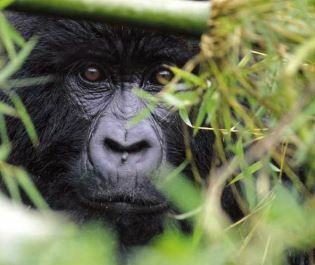 Only around 1000 mountain gorillas remain. And you're soon surrounded by an entire troop of them. For a unique wildlife experience, there really is nothing comparable, anywhere else in the world, than a gorilla trekking safari. A wild mountain gorilla safari is only possible in two African destinations. Uganda's Bwindi Impenetrable National Park and Rwanda's Volcanoes National Park offer a very similar experience, a thrilling trek through lush indigenous rainforest, followed by an hour with a habituated gorilla troop. Officially you can come within seven metres, although we've often found that some inquisitive gorillas don't follow the same rules. And which way do you turn when gorillas are above, behind, and in front of you? Trekking Group size is capped at eight and permits must be arranged in advance. They're expensive and the thought of paying over £500 for a single hour's experience puts some people off. However, we've never met anyone who has gone gorilla trekking and not thought it worth the expense. The thud of a blackback crawling past, the drumroll of a silverback beating his chest, infants playing beneath their mothers' adoring eye...it's so real that it's hard to comprehend what's happening. How to find these magnificent gorillas. Reaching the troop is on foot and requires a journey into untangled and untouched rainforest, with trackers slicing a path through the lush green. As a very general guide, the trekking is a little shorter in Rwanda, although it can still be anything from 30 minutes to four hours. Older and less physically fit visitors are allocated to the closest troop. Which National Park should you trek in? Rwanda is small and accessible so we'd recommend it if you're adding a gorilla safari onto a Kenya or Tanzania big game safari. Uganda has more habituated troops and some excellent chimpanzee trekking, perfect for really exploring the magic of the forest. 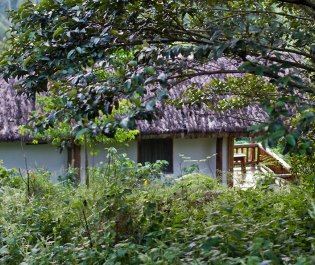 With mist fluttering across the canopy and various monkeys swinging past, we don't think you'll want to leave either of the gorilla destinations. If you can, go gorilla trekking twice and see a different troop. After the exhilaration of the first contact there's a calm. Take your photos then put the camera away. They look majestic and you're immersed in their world, admiring the beauty of the world's largest primates. It's an experience you'll be talking about for decades to come. This luxury lodge is simply stunning, with buildings built from local rocks, and a cosy lounge fit with a toasty fireplace. The unforgettable moment of meeting a wild gorilla is one we'd happily experience again and again, and this verdant park is perfect for your first encounter. 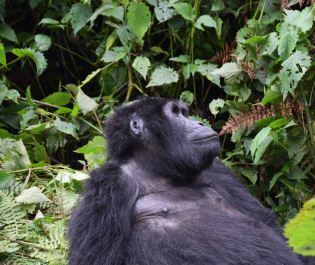 It's hard to explain just how life-changing meeting gorillas in Bwindi National Park is, so instead we believe you should experience it for yourself. 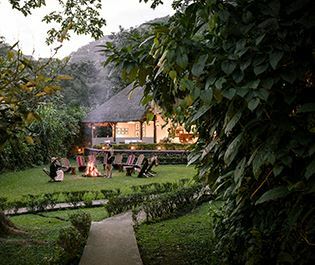 Rustic and charming, we love the open-air lounge and bar that overlooks the verdant Bwindi Forest - it's perfect for toasting a day of meeting amazing gorillas. 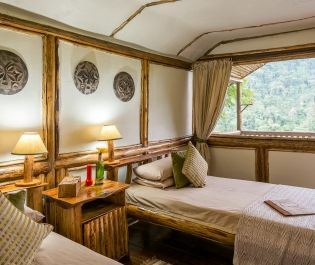 Such close proximity to Bwindi’s gorillas isn’t the only reason this lodge blows us away – it’s the rustic furnishings and inviting ambience, too. 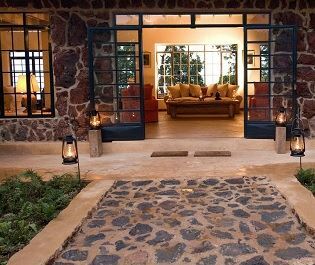 We love that these luxurious cottages are made of volcanic stone - it certainly adds a unique charm to an already beautiful lodge.